Remember how I mentioned that I love tags? Well, I love any variations on a tag as well, and at Christmas time one lovely variation is a paper ornament. They really are a like a little round tag with a built in hanger on them! I recently made a bunch of paper ornaments - solid shapes, open circles and decorative cut-outs. Let's have a look at each one and what you can do with them! Solid ornaments are really versatile. You can use them on a scrapbook page or card as an embellishment, add stickers, rub-ons etc to enhance them, write journaling on them or even mount a photo on them. You could also use them as tags on Christmas packages! 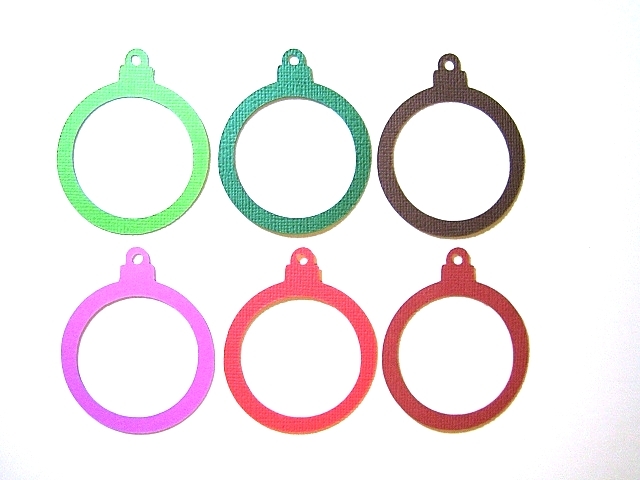 The open circle ornaments were designed specifically as photo frames. Simply crop a photo to the same overall size as the paper ornament and mount behind the frame. It's a really lovely look and would be great to actually hang on the tree, use on a scrapbook page or use as a picture gift tag...place a picture of the recipient in the photo frame and there will be no doubt who that gift is for! 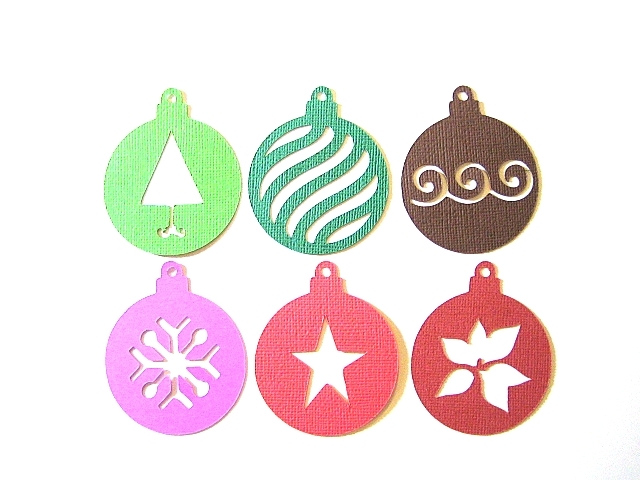 The paper ornaments with the decorative cutouts are just plain fun! Hang them on the tree as is, or place a solid ornament behind them to enhance the decorative shape. Imagine how gorgeous they would be if you added a little glitter to them! Again...they would be fab on a scrapbook page or card as well! My head is spinning with all the possbilities! You can contact me to purchase any of these ornaments! 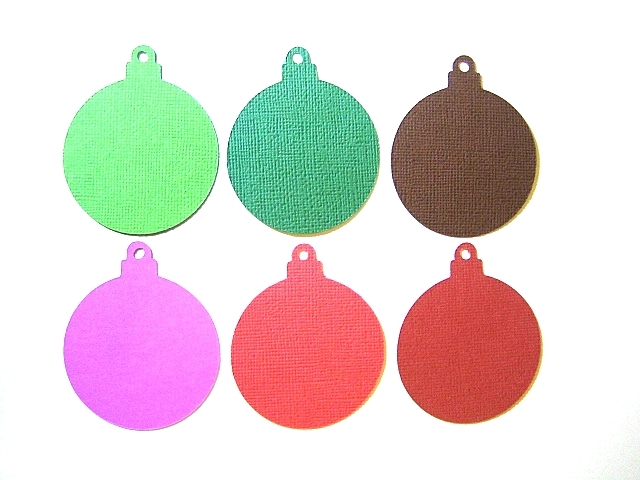 Each type of ornament comes in a Pretty Pak of six - you get one each in the following colors: Dark Red, Red, Dark Green, Lime, Sugarplum (purply-mauve) and Dark Gingerbread. Each ornament is approximately 2.75 inch. AND, you get enough silver cord to hang them on a tree or add to packages! All for $1.00 per pak! Stock up on all three types of paper ornaments - I promise you'll find so many uses for them! Aww, cute! Love the plain ones and can imagine fun stuff with them. Love the last set! Cricut?